French Emblems: Emblem: Pietas filiorum in parentes. La pieté des enfans envers les peres & meres. Nulla erit, erepto sed patre summa mihi. When Aeneas was carrying the dear burden of his father on his shoulders through the midst of the enemy, out of the flames destroying his homeland, he kept saying: Spare us. Carrying off an old man will bring you no glory; but carrying my father to safety will be the greatest glory for me. Si mon pere est par moy du danger delivré. TRaduit du grec d’un auteur sans nom. stost les arreste de malfaire. 1. This is based on Anthologia graeca 9.163, a much translated epigram. 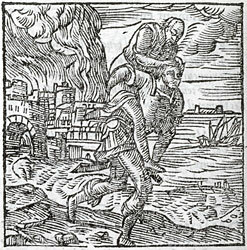 It refers to the celebrated incident of Aeneas’ rescue of his old father at the sack of Troy, carrying him on his shoulders through the occupied and burning city. See Vergil, Aeneid 2.634ff.